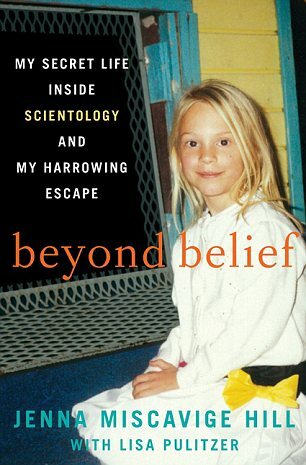 Hard labour, harsh discipline and scarely any time with her parents: the niece of Scientology's leader David Miscavige has just published a memoir on her childhood inside the movement. When Jenna Miscavige Hill first broke cover in 2008, growing numbers of former members were beginning to talk about their experience inside the Sea Organization, Scientology's elite cadre. For the most part however, they were talking in the chat rooms, on the message boards – and they were using pseudonyms. Even those of them who had spoken to journalists and academics were not yet ready to be identified: they feared the backlash from Scientology. Hill's open letter, initially published on the Internet then picked up by the mainstream news media, helped change all that. Jenna Miscavige Hill is the niece of Scientology's current leader David Miscavige. Her father, Ronald Miscavige, is the Chairman of the Board's older brother. So when she spoke up, she was difficult to ignore. At one point in her 15-page denunciation, she dismissed any suggestion that Scientology “encouraged” – as she put it – disconnection. Pouw's blanket denial was too much for Hill. In her response, she pointed out she had personal experience of disconnection, for when her parents had quit the movement and she, at first, had stayed behind. Following Hill's broadside, the floodgates opened and other former Sea Org members started speaking out on the record. I covered Hill's open letter at the time and soon afterwards she provided me with more details of her childhood inside Scientology. At the time, I did not have an outlet for that material (it was a year before the 2009 launch of this website). Now however Infinite Complacency is happy to be able to run some extracts of her account – a beta version, if you like, of her new book, Beyond Belief: My Secret Life Inside Scientology and My Harrowing Escape. Hill wrote that while in her letter to Pouw she had focussed on the issue of disconnection, “...the real issue goes far beyond that. “Even when I was not 'disconnected' my interaction with my family was blighted to say the least. From the age of five, I was only allowed to see my parents once a week,” she wrote. Hill's parents were in the Sea Organization, Scientology's elite cadre. As Sea Org members, they had signed a billion-year contract to serve the movement in this life and for countless generations thereafter. Nor was this in any way symbolic. Scientology founder L. Ron Hubbard taught that we all have immortal souls that travel from one “meat body” to the next. So once you were done with one life you would be expected to report for duty in the next. And her parents were not the only ones to have signed up. “I signed a billion-year contract when I was seven years old – and again when I was 12,” wrote Jenna. “There was a Ranch about 20 miles away from the Scientology Headquarters in Hemet. This was known as 'Happy Valley' or later renamed as 'Castile Canyon Ranch School'. “The property was many acres, it just had a couple of building when I first got there, no roads even, just a dirt road. The children of all of the members went there. It was a boarding school. We all lived there in adjoining dormitories. “There were seven girls in my dorm and it was adjoined to another dormitory of seven girls by a communal sink and single shower. We shared these facilities. The children who were there ranged from age 5-18. 6:30 – Wake up time. Clean berthing, get dressed. We would all stand in lines according to what unit we were in. Each unit had an in-charge whom we would call “sir”. They would take roll. Taking roll consisted of someone at the front of the group going to each unit and saluting the unit in-charge and saying, "Unit ____ report!" to which the other child would salute back and say, "all present and accounted for sir" and then they would move on to the next line. Bear in mind that some of the kids here were as young as five years old. During the muster, wrote Jenna, they would have to stand at “attention”, unless it was “parade rest”. Their uniforms would be inspected. Their dormitories would be inspected. And if you were late, if you failed an inspection, you would be hauled up in front of the group. An ethics folder in Scientology, is a little more than the gold-star/black-mark report card in a regular school. In Scientology, your ethical standing inside the movement is crucial because there are severe penalties if you slip too low down the scale. Another former Sea Org member John Peeler recalls that during his childhood inside Scientology, when he attended a Scientology-approved school, they had an ethics officer keeping them in line. Not only that, the children themselves were enouraged to write Knowledge Reports denouncing any of their peers they thought had broken Scientology's rules. And all of this was set out in Hubbard's writings, said Peeler. 7:00 -7:30 – Drill time. We would literally do military drills during this time, known as "close-order training", where we would stand in lines, march, salute and stand in different military positions, do "right face! ", "left face", "march! ", "company halt!". There were also fire drills, for which everyone had an assigned duty: evacuate the buildings, operate the fire hoses, roll the hose back up again afterwards. 7:30-8:30 - Post. Everyone had a different post. Mine consisted of making a list of every illness anyone had whether is was a cold or the flu. Then I was supposed to hand out vitamins to everyone. 8:30 - Breakfast. We ate in a mess hall and everyone had assigned seating and your table was called a mess. Each mess has a mess president and a treasurer. Each week someone at the mess would be the steward, which means that you would show up early to set up the table and were responsible for making sure all the food was at the table. 8:30-8:45 - Clean up, we all had assigned cleaning stations for the dining hall. Some people were responsible for cleaning dishes - I was responsible for sweeping the floor in one of the halls. These cleaning stations frequently changed, but everyone had one. If all of this sounds little more than Hogwarts without the spells, wait up. 8:45-9:00 - Another muster with roll. At this muster we were assigned labor projects in units. 9:00-12:45 - Projects. These projects consisted of such things as rock hauling from the creek in order to make rock walls, weeding large fields, planting ice plant, digging rows for large fields, irrigating large fields, raking the horse coral for the horse manure, etc. “This is how the Ranch became a very beautiful place,” wrote Jenna. “But we did all the work. “From lacquering our own dressers and beds, to planting the gardens and trees, harvesting the crops, building the green houses, etc. “About once a week these projects included going to the main Scientology headquarters and helping out in the crew galley or the bakery and at one point even helping in the manufacturing of the electropsychometers... [the devices Scientologists use during their auditing, or therapy sessions]. “Each project was assigned an in-charge and was written out in exact steps that had to be completed. 12:45-1:00 - Muster. We then met up in our lines in our units and took roll and everyone announced where they stood on their projects. 1:30-1:45 - Dining room clean-up time. 1:45 - Class roll call. Our names were all called out here to which we were to respond “Aye Sir!” or else we would be screamed at. "Here Sir" was also acceptable. “We had several adult teachers who were not certified teachers, they were just members of the Church who had been assigned to the Ranch...,” wrote Hill. But they used Hubbard's own system of learning: Study Technology, or Study Tech, which was geared more to Scientology's needs rather than those of the children. “We had what were called 'checksheets': these are lists of materials to study and practical exercises we had to, in order to complete a certain grade, so to speak,” wrote Jenna. “These were such checksheets as – 'How to make a bed course'; 'How to ride a bike course' (you had to pass a driving test with all hand signals before you were allowed to ride one); 'Shakespeare Course'; then of course Math, Geography and so on. And like any good Scientologist, they never went past a misunderstood word. For one of the golden rules in the Hubbard's system of learning, which he called Study Tech, is the following axiom. And that applied just as much to the kids, Jenna recalled. “After we read some material, we had to get a checkout which meant another child would ask us what the definitions of various words were in our textbook or material including small common words such as 'it', 'the', etc. “If we so much as hesitated one second or about the meaning of the work, we had to look up the word, definition by definition – use it in several sentences to improve our understanding and then look up the derivation of the word. The trouble with this kind of mind-numbing rote learning is it is just that: mind-numbing. Dave Touretzky and Chris Owen, veteran critics of Scientology, put it best in their critique of Hubbard's Study Technology. Study Tech’s focus on misunderstood words is not just some arbitrary bit of educational dogma. It is an intentional and effective device for suppressing critical thought. In effect, it atomizes language, divorcing words from concepts. The same words might appear in a Shakespearean sonnet or an L. Ron Hubbard bulletin but their collective meaning might be very different. The words themselves may be perfectly comprehensible but their meaning may not be. The context is stripped away, leaving the words to be studied in isolation. A good example of this jumps off the page at the end of Chapter 1 of Going Clear, Lawrence Wright's new book on Scientology. Wright explains Paul Haggis bewildered reaction when he finally got to study OT III: when he broke through the Wall of Fire to discover the space opera at the heart of Scientology. After a few minutes, Haggis returned to the supervisor. “I don't understand,” Haggis said. Haggis did so. In a moment, he returned. “Is this a metaphor?” he asked. As part of their education, Jenna and her fellow Sea Org children also employed another feature of Hubbard's Study Technology: the use of clay models. “Someone would have to come over and guess what it was – and if they could not guess then we would do it again,” Jenna wrote. Here again, Hubbard manages to reduce a common-sense idea to absurdity: Owen and Touretzky put their finger on the problem. “In secular terminology we would call this 'making a model',” they write. That is fine if the only goal is the accurate recitation of rote-learned facts. This is, in fact, the only goal that Hubbard was interested in with his Scientology students. If the morning's labours had not been enough to keep them in shape, the Sea Org kids also had physical education in the afternoon, Jenna recalled. 4:00-4:45 – PE, This was where somedays we played sports, but twice a week we were all required to run a mile and pass a physical fitness test by doing a certain amount of push-ups and pull ups, etc. 4:45-5:00 – Break. This is where we could go to the canteen and get food. But no sugar was allowed, so everything there was 100% sugar free, even the chewing gum. We would have to pay for the food out of our allowance which was $5 per week. But they also gave out oranges, etc for free. 6:30-6:45 – Clean up dining room. 6:45-9:00- Scientology studies. Here we would take the communications course and other such courses that taught us about Scientology and how to do volunteer minister assists, etc., and we would practice these on stuffed animals, etc. 9:00-9:30 – Take showers, get ready for bed. “This was every single day of the week, with the exception of Saturday and Sunday,” wrote Jenna. So what did they do on their time off? “On Saturday we had no class and instead in the morning we were required to, 'white glove' our rooms, which meant that we were to do such a thorough cleaning that we had to pass an inspection with one of the adults going over all surfaces with a white glove – literally. In the afternoon, it was back doing hard labour instead of study (such as it was), wrote Jenna. “Then in the evening instead of scientology studies we would have to white-glove all of the other buildings on the property such as the mess hall, the offices, the school house, the maintenance shed, etc. And then there was family time. “On Sunday morning until noon we were allowed to see our parents,” wrote Jenna. “During this time we were allowed to wear civilian clothes or 'civvies' as we called them. We had to change back into our uniforms at noon and the rest of that day continues as usual. “We all had assigned jobs and assigned 'seniors' who were also children. We were required to keep exact specifics of our completed jobs as a statistic and mark it on a graph. “We were also required to write down all transgressions and withholds which is basically any time we did something bad or similar to a sin in the Catholic religion. “After writing them all down we would receive a meter check (on the electropsychometer) to make sure we weren't hiding anything and you would have to keep writing until you came up clean. “This is from the age of 5 until I was 12,” she wrote. And doubtless that's all in the book. The sad thing about the details Jenna related here is that former members have been denouncing these practices – and worse – for years now. In a March 22, 1994 affidavit, former Scientologist Stacy Brooks Young had this to say about what she had witnessed. But nobody in authority was listening. Former members who grew up in the movement such as John Peeler have had similar stories to tell about their youth inside the movement. So too has Astra Woodcraft, who with Hill and Kendra Wiseman set up the Ex-Scientology Kids website. In a statement there, she summed up what she and many other children had had to endure. No child should be subject to sleep deprivation, grueling physical labor and intense psychological abuse. No child should be denied an education or denied contact with their family. Unfortunately, all of these things were the norm for me and other kids who grow up in Scientology's military like organization called the Sea Organization. I was forced to work 80+ hours a week. I was regularly yelled at and threatened. I was not allowed to make phone calls or leave the building without permission. I was not allowed to see my family. I was married at 15 and ran away, pregnant with my daughter at the age of 19. Scientology officials chased me down and attempted to convince me to have an abortion. My own family, as well as many others has been torn apart due to Scientology's practice of disconnection. My daughter's father who remains in Scientology has never been a part of her life because of his beliefs. She... has grown up without a father because of Scientology. Which brings us full circle back to disconnection, the practice that Scientology Pouw denied existed inside the movement. Why would any parent accept this kind of life for their children? Partly because of what Hubbard taught about the nature of children – and how to treat them. Hubbard's Messengers, teenage acolytes who ran his errands, were trained to deliver his orders – and other Scientologists were expected to behave as if Hubbard in person had commanded them. But the flipside of letting children act like tyrants, was robbing them of their childhood. To date, the authorities in the United States have taken no action to stop what, on the face of it, looks like the criminal neglect of children inside Scientology. Jenna's book will at least make it that little bit harder to ignore. 1“Church of Scientology statement: Andrew Morton's Unauthorized Biography of Tom Cruise” issued January 14, 2008. 2Note Pouw's use of the word “encourage”. In fact, Scientology forces its members to disconnect from anyone declared an enemy, or “suppressive person”, in the movement's parlance – if they disobey they face being declared suppressive themselves. For details, see my summary of this policy in Disconnection: an Introducion, elsewhere on this site. And for a particularly egregious example of disconnection, see “The Hendersons' Story”. 3I gave more details of this in a previous post announcing her book project, “And Jenna makes Three”, in which I showed how her open letter encouraged others to go on the record. 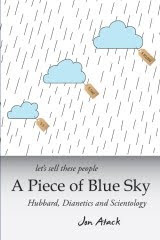 (As it turned out, there were more than three books in the pipeline: as well as Lawrence Wright's book Going Clear and Tony Ortega's project, there was John Sweeney's book The Church of Fear, published last month; and the new edition of Jon Atack's A Piece of Blue Sky, due out any day now. And I know of at least one more book in the works). 4See “John Peeler's Story”, elsewhere on this site. 5This sentence is set out in italics for emphasis in most of the Scientology books I have. According to Dave Touretzky and Chris Owen, in their critique of Hubbard's system (see following note) it was originally printed in BLOCK CAPITALS on page 282 of Hubbard's How to Use a Dictionary. 6From Chris Owen and Professor Dave Touretzky's Scientology’s Study Technology: The Hidden Message in L. Ron Hubbard’s “Study Tech”. Owen had already distinguished himself with his dissection of Hubbard's false claims to war heroism (see his online study “Ron the War Hero”, which you can find at this invaluable resource page). Touretzky, a research professor in computer science at Carnegie Mellon University, has a particularly low tolerance of Hubbard's pseudo-scientific charlatanism. His critiques of the Hubbard's Study Tech; the Narconon centres running Hubbard's dangerous addiction treatment system; and of the e-meter itself, an essential prop in Scientology auditing, repay careful reading. 7From Chapter One, The Convert, page 19 of Lawrence Wright's Going Clear: Scientology, Hollywood and the Prison of Belief, by Lawrence Wright. (Alfred A. Knopf, 2013). 8From Scientology’s Study Technology: The Hidden Message in L. Ron Hubbard’s “Study Tech” by Chris Owen and Professor Dave Touretzky. Jenna added: “We also were "meter checked" on an electropsychometer once a day being asked if we went past any words we didn't understand in our materials.” But let's not get started on the problems of the e-meter or we'll be here all day. Tonja Burden served as one of Hubbard's personal servants, or Messengers, on board the Apollo in the early 1970s. In a January 25, 1980 affidavit, she explained what that meant in practice. 10The fact that Stacy Brooks Young has gone back on some of her previous testimony is neither here nor there. The accounts given by Hill and several other former children of Sea Org members corroborate this account. 11ESK comment for the media. 12Astra Woodcraft describes in more detail her experiences growing up inside Scientology in this January 2007 affidavit. 13One Scientology website puts it this way: “Children are thetans occupying small bodies, a crucial datum that provides the only perspective from which they can be understood.” From New Era Publication's page advertising Hubbard's Child Scientology. My thanks to Caroline Letkeman for drawing this to my attention. I look forward to reading her book. Thanks for this review. My God what she and other kids went through. No matter how many times I hear the childhood stories of Jenna and the others, I can't help but feel outrage. As a father of two, and no connection to Co$, this is what drives me to follow and support the broader anti-Co$ movement. Very interested in reading this book. What a brave woman. Excellent intro, and nice job bringing in Owen and Touretzky on the various "learning" methods. Coming from a family of teachers, I'm always saddened that people (and in particular children) suffer this. Thanks for that, Jens. For the footnotes, I'm afraid I've never been able to sort that one out, so we'll have to stick with manual instead of automatic!